Peplink is a market leader in Internet load balancing and VPN bonding solutions. Peplink Network Solutions product line includes models for business of all sizes, and provides an award winning Internet experience for customers. Peplink Balance Multi-WAN Routers have been deployed around the world, helping thousands of customers from varied industries to increase bandwidth, enhance Internet reliability and reduce costs. 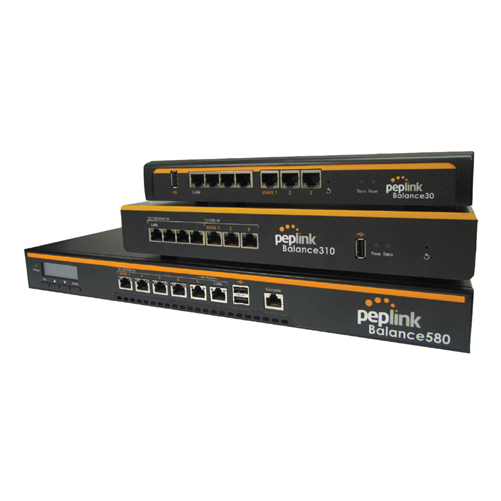 Please feel free to browse the Peplink Network Solutions range below and contact us with your requirements. Use Load Balancing and SpeedFusion bandwidth bonding to deliver superfast VoIP, video streaming, and data using an SD-WAN enabled network. Even with a basic Balance 20 dual-WAN router, you can mix different transport technologies and providers to keep your network up when individual links go down. Switching between links is automatic and seamless.